Monumental church dedicated to the Holy Family, Gaudi's most famous work, the finest example of his visionary genius, the worldwide symbol of Barcelona and the Cathedral of the third Millennium. 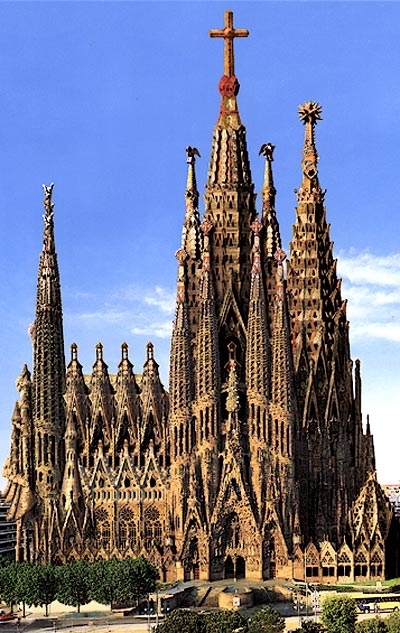 The expiatory Temple of Sagrada Familia was begun in 1882 by the architect Francesc de Paula del Villar i Lozano, after certain divergences with the promoters and had begun only the crypt, gave up the direction of the work. The Cathedral is a synthesis of his architectural knowledge with the complex system of symbolism and a visual explication of the mysteries of faith. There would be extraordinary façades representing the birth, death and resurrection of Christ with eighteen towers symbolizing the twelve Apostles, the four Evangelists, the Virgin Mary and the Christ. The whole of the building is an allegory of the Christian religion. The 170 height meters arrow will incarnate Christ. The uniqueness and complexity of the project, make practically impossible to give a precise date of time necessary to build the remaining ten domes.